RCD-250 Pressure Controlled Coring Machine - OFI Testing Equipment, Inc. 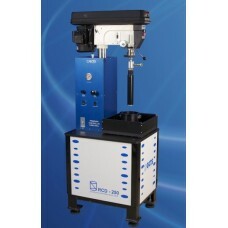 The GCTS Laboratory Coring Machine is capable of achieving a large range of spindle speeds to provide optimum performance when preparing test specimens, regardless of the properties of the material being sampled. All accessories are included (water swivel, drip pan, sample holder. Other standard or custom barrels are also available. The main feature that sets this coring machine above any other is the force/stroke control to optimize feeding rates for superior performance when coring material, which is not homogeneous. Rigid multi-column drill support frame to eliminate ridges on specimen.